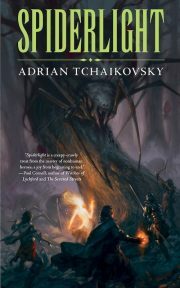 Adrian Tchaikovsky’s 2016 Spiderlight is a secondary-world fantasy. Dark Lord Darvezian’s legions of darkness threaten to overwhelm the forces of light. He is but the latest in a long line of Dark Lords. So far, each of them has been brought down thanks to instructions provided by confusingly worded prophecies of unknown provenance. Nth expected to spend his life with the rest of the brood serving the great spider Mother in a forest few dare to enter and fewer live to exit. Then one day, a party of ambitious murder hobos comes calling. 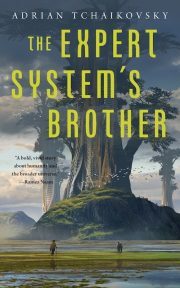 Adrian Tchaikovsky’s 2018 The Expert System’s Brother is a standalone science fiction novella. Aro is a village like any other: nestled next to a great tree, run by ghosts sharing the bodies of living persons, persons selected by the wasps. Handry was an unremarkable example of an Aro inhabitant … until the day of the mishap. 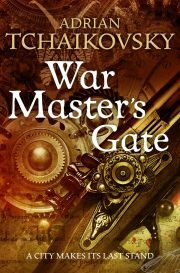 2013’s War Master’s Gate is the ninth and penultimate volume in the Shadows of the Apt decology. The Wasp Empire may be short on kindness, egalitarianism, and respect for human rights, but it compensates with warlike resolve and deep reserves. It has failed many times to crush Collegium, but, undaunted, its forces are marching into the Lowlands yet again. 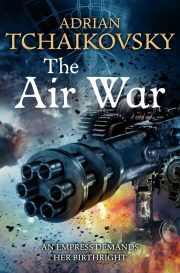 2012’s The Air War is the eighth book in Adrian Tchaikovsky’s Shadows of the Apt series. Her empire is now secure. But the Empress suffered too many years under the thumb of her brother (the late Emperor) to tolerate potential threats, within or without the empire. Every kingdom, city-state, and commonwealth outside the empire might someday menace her rule. Therefore they must be conquered. QED. 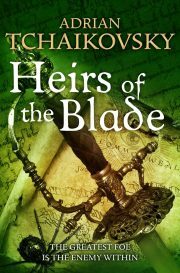 2011’s Heirs of the Blade is the seventh volume in Adrian Tchaikovsky’s Shadows of the Apt series. None of Tynisa’s closest friends have seen Tynisa since she fled after mortally wounding her foster-sister’s lover. She was not really responsible, as she was mesmerized by an enemy spellcaster at the time. Still, the guilt haunts her. So does the memory of Salma, Prince-Minor Salme Dien, whom she loved but lost to another and then to death on the battlefield. Tynisa ventures to Leose, princely seat of Salma’s family the Salmae. There she meets his aristocratic family. She meets also meets Salma’s brother Alain, who might almost be Salma’s twin. Small wonder if she allows herself to fall for the silver-tongued aristocrat. 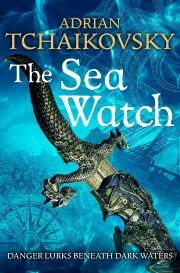 2011’s The Sea Watch is the sixth volume in Adrian Tchaikovsky’s Shadows of the Apt. In the midst of a contentious election, Stenwald Maker is alarmed to discover that his niece Cheerwell has chosen not to return to Collegium following the Khanaphes expedition. Worse yet, the ambassadors from the ant city-state of Vek see ill intent in the fact that Collegium has also received envoys from the ant city-state of Tsen. Of all possible enemies, ants feel the direst hate for other ants. 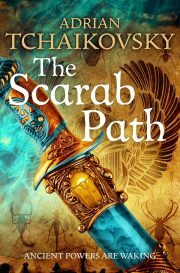 2010’s The Scarab Path is the fifth volume in Adrian Tchaikovsky’s Shadows of the Apt series. To Collegium’s scholars, Khanaphes is a distant enigma. Like Collegium, Khanaphes is a Beetle city. Unlike Collegium and the other Beetle communities of the Lowlands, Khanaphes is oddly backward. It seems to be an ancient city immune to historical processes. Cheerwell “Che” Maker has a hypothesis. Perhaps Khanaphes’ Beetles are Inapts, magical adepts blind to machinery. Cheerwell knows from bitter experience that this is possible, because she is just such an Inapt Beetle. Opening her mind to dangerous dark forces came at a cost: her ability to comprehend even simple mechanical devices. Still, a chance to improve her magical skills cannot be passed up. She decides to join Collegium’s expedition to Khanaphes. Collegium’s second expedition, that is. 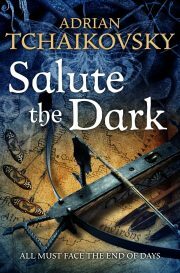 2010’s Salute the Dark is the fourth book in Adrian Tchaikovsky’s Shadows of the Apt series. Despite the efforts of Stenwald Maker, niece Cheerwell, ward Tynisa, and the rest of Stenwald’s agents, the war against the Wasp Empire is not going well for the city-state of Collegium and its allies. 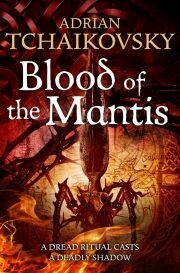 2009’s Blood of the Mantis is the third volume in Adrian Tchaikovsky’s Shadows of the Apt series. 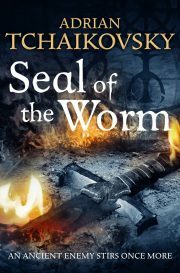 Spymaster Stenwald Maker is tasked with the surveillance of two other city states … but he has only a few trusted agents. He decides to split his forces. This may or may not be a bad decision. Dividing one’s forces often is. 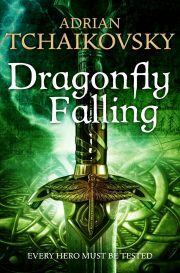 2009’s Dragonfly Falling is the second volume in Adrian Tchaikovsky’s Shadows of the Apt decology. The city-state of Collegium is the keystone of Lowland resistance to the coming Wasp Empire conquest of the lowlands. The Empire tried — and failed — to remove Collegium from the board with a swift, bold gambit. No matter. When cunning fails, there is always brute force. 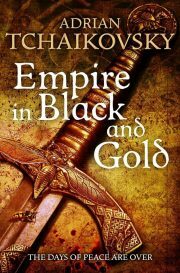 2008’s Empire in Black and Gold is the first volume in Adrian Tchaikovsky’s Shadows of the Apt decalogy. I should note that he completed the whole ten-book series in eight years. Completed, I say, completed. This may be of interest to certain other authors whom I will not name. In the seventeen years since the Empire of the Wasps conquered the Commonweal city of Myna, Stenwald has been unable to convince his fellow citizens that Collegium (as well as the other city-states of the Lowlands) are on the Wasps’ to-conquer list. Most Lowlanders find it comforting to believe that the Wasps are sated with conquest. Stenwald knows that the Empire was merely taking its time to recover from its long war with the Commonweal. Now there are hints that the Empire has recovered. Anyone who has read Adrian Tchaikovsky’s ten-part Shadows of the Apt series, with its insect-themed kinden (clans) might well think that Tchaikovsky is fond of bugs. Unlike so many of the rest of us. Remember the neighbourhood kids warning you about earwigs? Those horrifying creepy crawlies that might even now be laying their eggs in your ear while you are distracted reading this text? You don’t know the half of it. 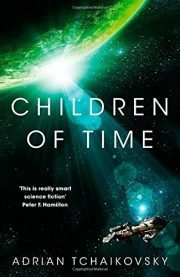 But you will, once you read 2015’s Children of Time. Centuries from now, the never-modest Doctor Kern thinks of the nameless world twenty light-years from Earth as “Kern’s World”; she may not have terraformed the world, but she certainly plans to populate it with a species of her creation; monkeys infected with a nanovirus designed to push the primates towards intelligence. Everything goes exactly to plan … except that there’s a catastrophic, civilization-levelling war back on Earth. All the monkeys are killed before they can reach Kern’s World. However, the nanovirus reaches the surface. There, it finds alternate hosts on whom to inflict the Exaltation of Beasts.